Bordine’s nursery is a large greenhouse facility that has found an outstanding niche for using wood-based thermal energy. Many area municipalities, landscapers, and other businesses supply solid-wood waste that feeds a 10 million btu Vyncke boiler that supplies hot water for an extensive heating grid and steam to produce 3 megawatts of electricity. The facility heats about 11 acres of greenhouses and over 50 hoop houses. The nursery services Bordine’s retail centers across the greater southeast Michigan region. More information about Bordine’s Nursery can be found here. The VA Battle Creek built a wood chip fueled high pressure steam boiler to turn a turbine a produce about two miliwatts of electricity. Excess steam is used for heat, reducing natural consumption by about 60 percent. The facility has about 35 buildings, about a million square feet, located on a 206 acre campus. The CHP system was commissioned in 2015. Pinecrest is located in Powers, Michigan, in northern Menominee County in the south central part of the Upper Peninsula. The facility offers medical care, Alzheimer’s care, physical, occupational and speech therapy, and can house up to 160 residents. 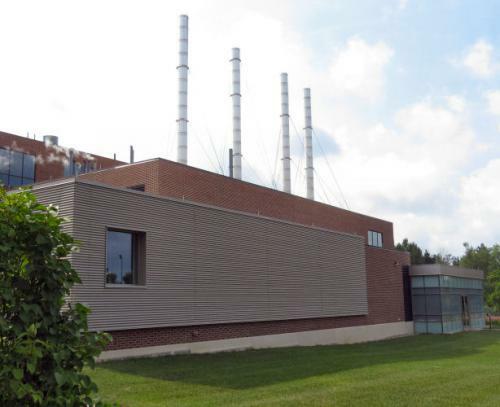 There are 170,000 square feet in four buildings that are both heated and cooled using a low-pressure steam district energy (DE) system fueled primarily by wood chips. Cooling is provided by a Trane absorption chiller, which runs water at 42 degrees Fahrenheit. The system also provides domestic hot water, high-temperature hot water (e.g. dishwashing), and hot water for the laundry. There are two natural gas backup boilers. Pinecrest also has a 10 kw solar panel array connected to the grid that was funded by the Michigan Energy Office. 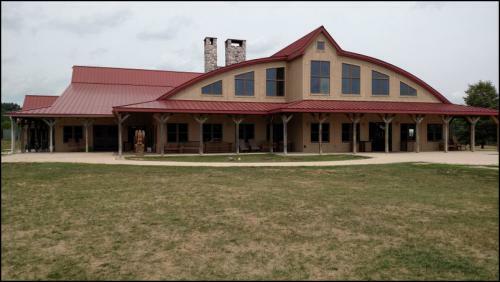 These facilities are located among the Irish Hills in Jackson County, including the 240-acre Stoney Lake. About 17,000 people visit each year, from all over the world. The main building, Malachi Hall, is 16,000 square feet and heated with forced air using the heat from a pair of outdoor cordwood boilers. Fuel is supplied by camp personnel and volunteers from woodlands on the property. Additionally, the system supplies the hot water needed for the kitchens and other uses. The system uses a 1600-gallon thermal storage tank. The Mariner North is located in downtown Copper Harbor, a small town near the tip of the Keweenaw Peninsula. Six buildings are heated with hot water from a 250,000 btu, water-jacketed Central Boiler. About 40 cords of wood are used during the extended cold season. Alternative heating is either with propane or fuel oil, as the natural gas grid does not reach Copper Harbor. Upper Austria, a state in northern Austria, has a well-developed, wood-based heating sector, including home-based automatic pellet boilers, micro-grids and other district energy installations, and CHP facilities that use wood. This model has been very successful and serves as a good example of what can potentially be built in Michigan. Mid-Peninsula School has burned wood chips since 1984 and have had upgrades to the original system. The North Central Schools installed their first wood chip systems in the early 1980s and replaced the boiler in 2014. North Central has access to natural gas but burns wood. North Dickinson County School installed their wood system in 1991. The Republic-Michigamme Schools burned fuel oil prior to 2012. The savings obtained by the conversion to wood chips has been well-accepted in the communities and the school loves it. These schools each heat roughly 50,000-100,000 square feet, as well as domestic hot water. Different suppliers deliver the wood chips. All of the schools save enough money (over fossil fuel consumption) to pay approximately the cost of a teacher, which is significant to these small rural schools. Messersmith is one of the nation’s leading manufacturers of wood chip heating systems. Engineer and CAD technician designs include the chip bins, augers and conveyors, chip sorters, combustion chambers, emissions control, and other components to suit the requirements of each particular project. Additional supplies of new woody biomass for an expanded bioeconomy are available (1) in Michigan’s natural forests (about 3.40 metric tons/year), (2) in new biomass plantations on idle, underused, non-agricultural land (about 2.42 metric tons/year), and (3) from urban wood waste streams (about 2.20 metric tons/year). Together, these potential new resources could provide over 8 million dry metric tons of biomass – enough to almost triple the size of Michigan’s current wood products industry. This snapshot is part of the assessment portion of the Michigan Statewide Wood Energy Team grant. Using two databases, various fuels used heat and cool Michigan buildings can be segregated. A series of county-based graphics help illustrate the use of different fuels used for households and for boilers regulated by the State of Michigan. Depending upon a number of site-specific circumstances, wood chip systems are often cost-competitive with all fossil fuel alternatives. Wood pellets are cost-competitive will all fossil fuel alternatives except natural gas. The graphics show how advanced wood-based thermal technologies could be deployed. Data sources were 1) Michigan Department of Licensing and Regulatory Affairs, and 2) U.S. Census Bureau, American Community Survey. Case studies provided by MI SWET.